Preheat oven to 325 degrees, and line a baking sheet with parchment. In a large bowl, toss the oats with cinnamon and salt. In a medium bowl, whisk together oil, honey, sugar, vanilla. Pour the honey mixture over the oats and use your hands to evenly combine them together. Spread the mixture out evenly onto the baking sheet. Bake for 10 minutes, then remove from the oven and stir. 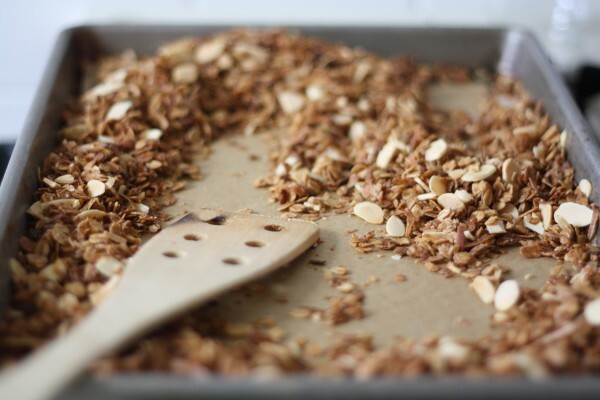 Sprinkle the coconut and almonds over the granola and return to the oven. Bake for 10-15 more minutes, checking every 5 minutes and stirring if necessary. When your granola is done and toasty brown, remove from oven, cool completely, and toss in the cranberries. Thanks for the recipe. Love the granola!